The meat of choice for me when eating Mexican food is always pork! I would pick it over beef and chicken any day. I was super excited about making Chile Verde because I get to cook with tomatillos and use a blender to make a sauce (I’ve never done that before) and well…its pork! I was also excited to make something other than bean burritos and pre-marinated carne asada from the supermarket. I’ve been researching Chile Verde recipes for about a month and finally had a chance to make it. The worst Chile Verde I had was served with hard pork in sour green sauce. 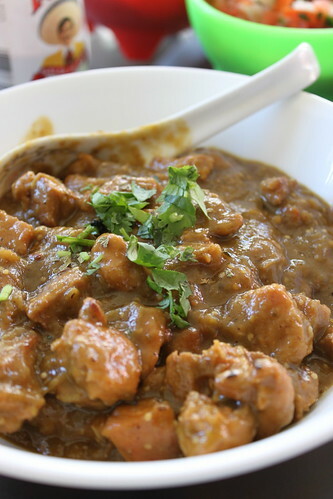 So, it was really important to me to find a recipe with the right amount of spice and flavor in the sauce and pork that is tender and not too crispy, dry, and hard. 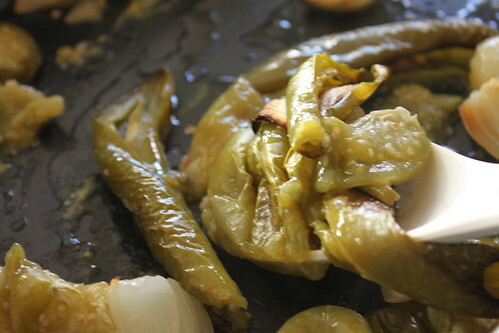 For this recipe, I received plenty of useful tips and pointers of some of my friends who’ve made this dish before and researched multiple sites for the best Chile Verde recipe and made it. The dish turned out as authentic as I thought it should be and I feel very satisfied learning how to cook another Mexican dish. Cut pork into bite sized pieces and transfer to bowl. In a small bowl, whisk salt, chili powder, garlic powder, cumin, and Mexican oregano until combined. Liberally season pork cubes with seasoning until evenly coated. Note: Don’t use the entire seasoning! Add vegetable oil and let marinate for at least half hour. On Medium High heat, begin searing all sides of pork until browned and set aside or leave in skillet until sauce is ready. Preheat oven to 350 degrees. 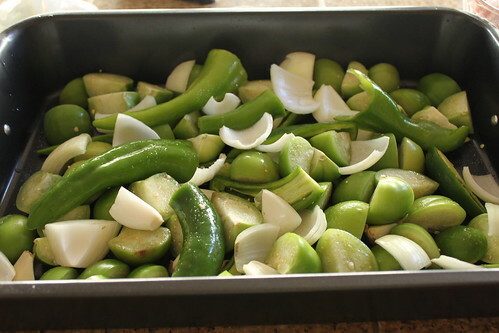 Cut tomatillos, jalapenos, Serrano pepper, Anaheim chiles, and onion and spread over roasting pan. Add 5 cloves of garlic. Sprinkle some salt and drizzle some vegetable oil over the top. 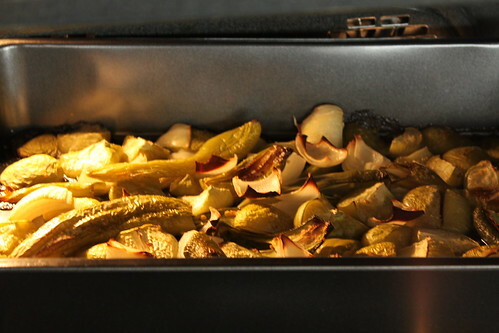 Once oven is preheated, roast chiles for a little over an hour or until chiles begin charring. Take out of the oven and allow to cool for 10-15 minutes. Transfer contents from the roasting pan to a blender. Pour chicken broth into the roasting pan and scrape up remaining bits on the roasting pan. Pour chicken broth and remaining bits to blender. 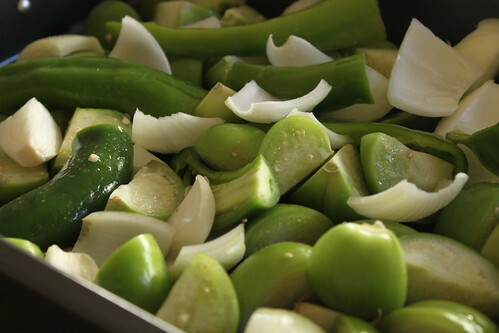 Add salt, pepper, sugar, and Mexican oregano to the blender and begin pureeing Chile Verde sauce until smooth. Taste and add additional salt and/or sugar as desired. 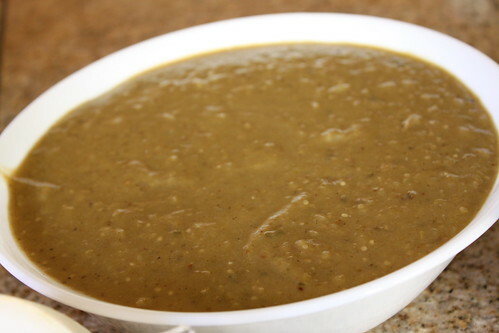 Pour Chile Verde sauce and 1/2 cup of water over cooked pork. 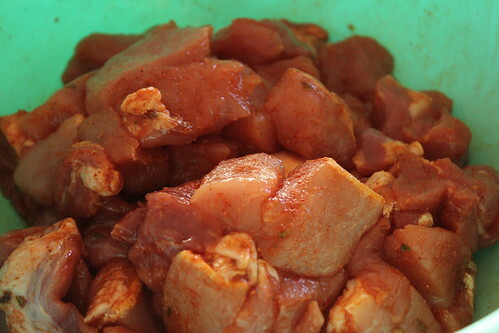 Mix cooked pork into the sauce until completely combined. 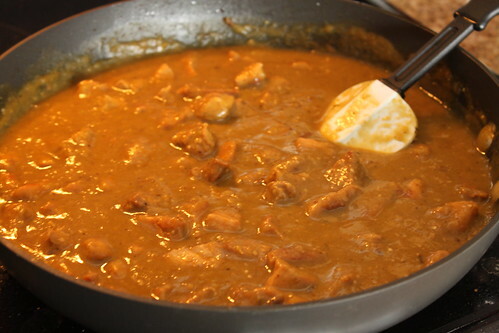 Allow pork to simmer in the sauce for about 1 1/2 hours or until pork becomes very tender. 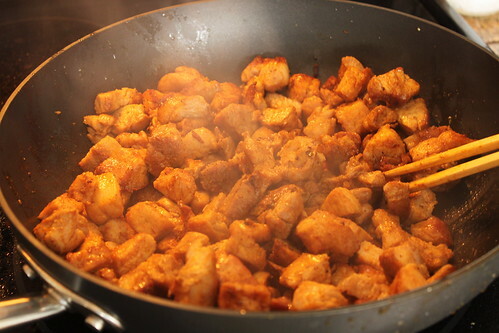 Stir pork in sauce every 10-15 minutes. 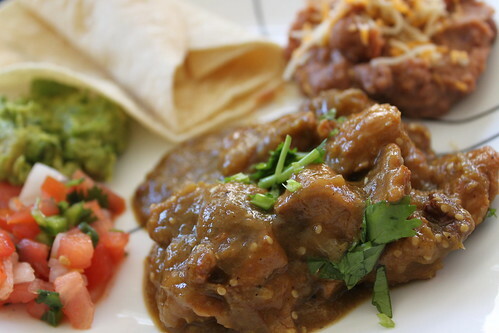 Serve over tortillas, rice, and/or beans with your favorite condiments. Wow! That looks really good. This looks great, nice photography too!